You can always rely on WSJ Magazine for a solid cover image and the magazine’s December/January offering is no different. After a beautiful Reese Witherspoon cover for November, Dutch photographic duo Inez van Lamsweerde & Vinoodh Matadin took model Rianne van Rompaey and stylist George Cortina to Greece for this month’s cinematic cover shoot. 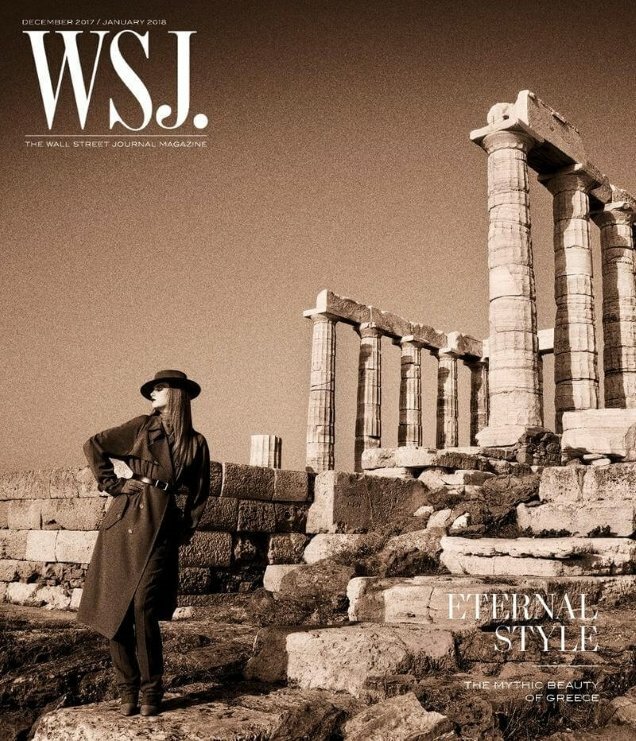 In the sepia-toned image (below), Rianne stands before the ancient Greek Temple of Poseidon, striking a pose wearing a Ralph Lauren trench. Our forum members were in awe of the cover. “WOW I love this! Feels very vintage but modern at the same time,” admired 333101 at once. “George Cortina rarely disappoints. We need him at Vogue Paris. He is the king of glamour!” wrote Lola701. “Inez & Vinoodh have pulled it out the bag ONCE AGAIN with another spectacular location shoot. The cover is simply divine,” added vogue28. Also overjoyed with the outcome was mathiaskatz. “Rianne has yet to disappoint,” she admired. “She really always delivers, doesn’t she?” KateTheGreatest echoed. Forum members also praised the accompanying cover story. “I didn’t like the cover, but now that I’ve seen the edit I can appreciate it more! It looks like stills from an indie thriller. Rianne is truly spellbinding here,” commented Benn98. “That’s a good editorial. Very Italian Vogue circa 00s,” Conbothsides pointed out. “Amazing,” described narcyza and we couldn’t agree more. See more from WSJ‘s stunning cover story and share your opinion with us here.